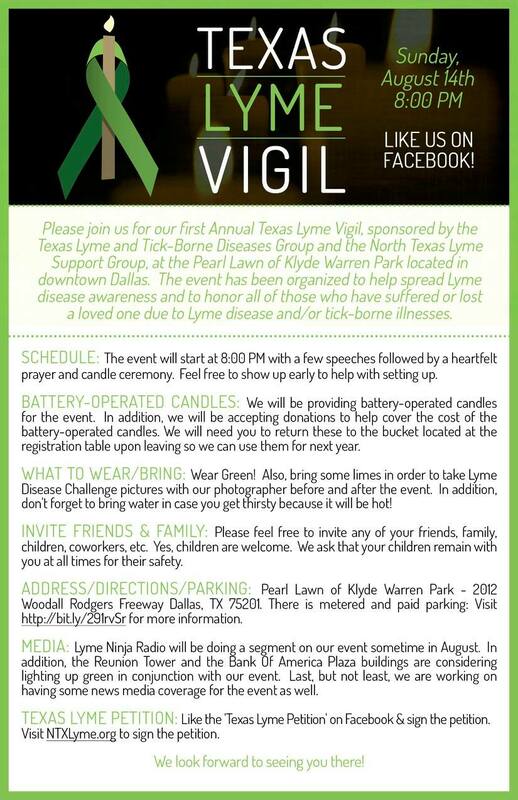 On Sunday, August 14th, Lyme disease patients and supporters will hold a candlelight vigil at Klyde Warren Park to help spread Lyme disease awareness, and to honor all of those who have suffered or lost a loved one as a result of Lyme disease and/or tick-borne illnesses in the state of Texas. 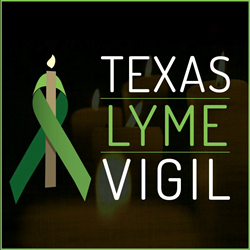 Since Lyme disease is being contracted at an alarming rate in Texas, we want to honor all of those who have suffered from Lyme and TBD, especially those who have passed away. Texas is overdue for Lyme reform to help prevent some of this from happening. The Texas Tick-borne Diseases Group and the North Texas Lyme Support Group have organized this event to let the public know that Lyme disease is indeed in Texas, and that it is very prevalent. Lyme disease sufferers want you to know what signs and symptoms to look for in order to get a proper Lyme diagnosis, and that there are groups here in Texas that will help guide the way. In addition, those afflicted with Lyme and tick-borne diseases are calling upon the news stations and media to do a segment on the Texas Lyme Petition, which is currently gaining traction on change.org. Their goal is to push reform in regards to Lyme disease in the state of Texas. A key concern of Lyme disease sufferers in Texas is the refusal of the Texas Medical Board (TMB) to acknowledge the existence of chronic Lyme disease. Lyme patients need the TMB to update its Lyme guidelines and require updated Lyme CME (Continuing Medical Education) trainings to reflect the fact that many patients require longer-term treatment beyond the limit of 4 to 8 weeks of antibiotics specified by the IDSA. Due to the inaccurate Lyme guidelines in Texas, it has led to thousands of people in Texas being misdiagnosed and/or undiagnosed each year. In addition, this has led to a number of Lyme related deaths. For the Lyme patients receiving proper Lyme diagnosis, Lyme patients continue to be denied treatment by doctors and insurance coverage for treatment. The vigil will take place from 8:00 - 9:00PM on the Pearl Lawn of Klyde Warren Park in downtown at 2012 Woodall Rodgers Freeway, Dallas, TX 75201. Music will be provided by Tammy Swofford and the Kopy Kats followed by a speech, prayer, and candlelight ceremony. Lyme Disease Challenge photos will be taken in front of the infamous Tick Slayer jeep, owned by Becky Summers, before and after the event. The Bank of America Plaza building will be lit up green in honor of Lyme disease sufferers. Lyme Ninja Radio will be covering the event to help spread Lyme awareness in Texas. Mark Laster photography and Martha Boykin Photography will be capturing the event for a slideshow and possible video.